Father's Day defined by Wikipedia was "inaugurated in the United States in the early 20th century to complement Mother's Day in celebrating fatherhood and male parenting". As in the past, Father's Day now is a great way to show honor and celebrate those persons that have made a difference in each of our lives. Ultimate Globes has a long standing tradition of helping people find unique gifts that will provide a lasting impression for many years. This year we have picked out a few of our models that you may want to consider when shopping for a gift. Each of these items make a great addition to an office, study or home living space. The Legend Globe is made up of an up-to-date 12 inch Blue Ocean world globe with raised relief and a beautiful metal base and numbered semi-meridian. This globe features over 4,000 named places and points of interest, 6,711 nautical miles of shipping routes and has a scale of 1:41,849,600 or 660 miles per inch. It freely spins left or right to view all of the locations or potential vacation spots. It is a perfect addition to office space. term "antique", this is only used to signify the color of the ocean areas, the actual landmasses and point of interest are up-to-date. This globe features a full-swing meridian, meaning you can swing the globe forward and backward as well as side to side to view all of the areas without obstruction. The globe is mounted on a yoke style metal configuration atop a dark walnut finished wood centerpiece. The base is a finished steel square platform giving the needed weight to keep the globe from tipping over during use. The 16 inch globe ball is the perfect size for viewing all of the named places and points of interest. The larger globe allows for a slightly larger font making it easier to read. This globe does require a small amount of assembly, and can be done in about 5 to 10 minutes. This globe makes a good addition to both the office or home. 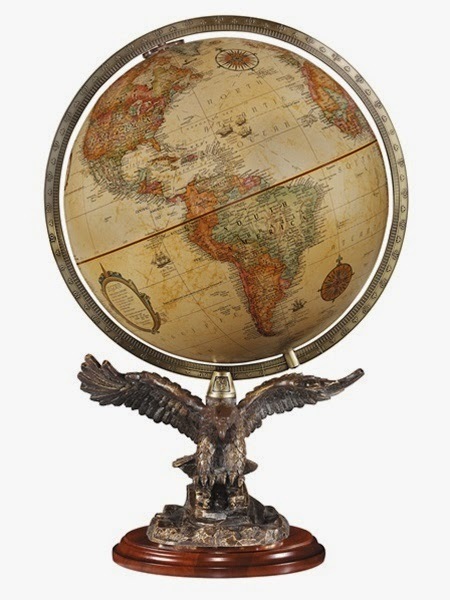 The Freedom Globe is a consistent favorite year after year, providing that masculine look and feel that only a Globe atop an Eagle could covey. Whether your father served in the military or is simply a patriotic individual, this globe is sure to please. 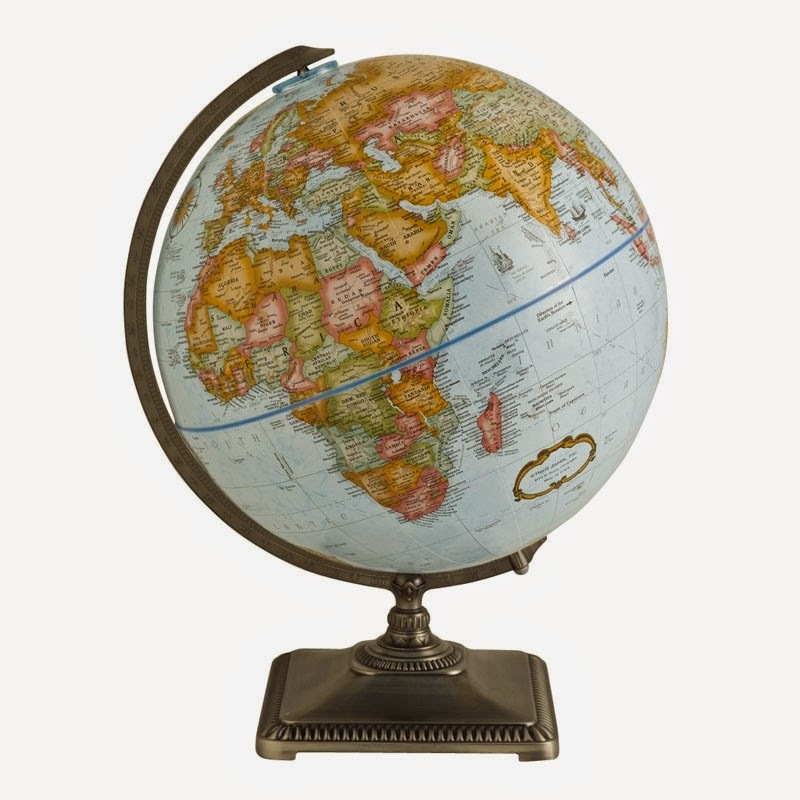 Featuring a 12 inch globe ball mounted in a stationary numbered meridian, this globe can move side to side to view each of the landmasses and point of interest. The Eagle itself is a resin Golden Bronze finish mounted on top of a cherry wood platform. The overall height is 20 inches and the up-to-date map uses antique styling to give it that unique look. Excellent uses are on a larger desk, bookshelf or as a centerpiece on a conference room table. Wherever you choose to place it, you will not be disappointed in it's style. Whichever globe you choose to celebrate Father's Day we are happy to serve your needs. In addition to great low prices, Ultimate Globes includes a Free Extended 1-Year Manufacturers warranty. So instead of only a one year or in some cases 90 day initial warranty against manufacturing defects, you will receive an extra year with the purchase of any of these globes. In addition you will enjoy free entry to our "Updatedable-Globe-Program"! Yes, when the world changes (and it does) you can simply call on our customer support to assist you in purchasing a replacement globe ball for only 50% of the original cost. This is a great way to keep your globe updated without having to start all over. Order early to take advantage of our free economy ground shipping, but if you are a last minute shopper like me, we provide other discounted express services as well. Have a great Father's Day from all of us at UltimateGlobes.com!